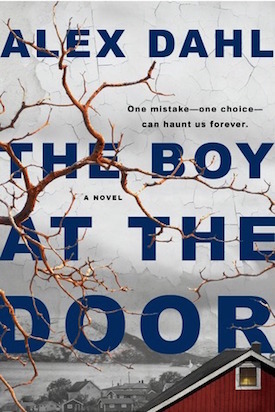 It’s hard to imagine a summer read better tailored to Crime by the Book than a Scandinavian psychological suspense novel, aka a combination of my two favorite kinds of crime books—and that’s exactly what readers will get in THE BOY AT THE DOOR by Alex Dahl. As an avid reader of Nordic Noir, I was fascinated by the concept of a psychological suspense story set against a Nordic backdrop; I couldn’t wait to see how Dahl would balance these two often extremely different styles of crime writing. What I discovered in THE BOY AT THE DOOR well exceeded my expectations. A binge-worthy story of suspense with dark and weighty undercurrents, Dahl’s first novel strikes an excellent balance between the melancholy and gloom of Nordic crime and the breezy pacing of your favorite beach read. Despite its well-deserved “binge-read” status, THE BOY AT THE DOOR tackles genuinely difficult themes: most prominently, addiction and the pressures of motherhood take center stage here. It’s a winning combination, and, set against the atmospheric and picturesque backdrop of Scandinavia, Dahl’s tense and menacing story of familial suspense is a summer standout. Add this to your summer reading list and set aside a weekend to tear through its addictive and taut interpersonal mystery. Let’s start at the very beginning: does the distinction between “Nordic Noir” and “psychological suspense” really matter in readers’ understanding of this book? As both a reader and a reviewer, I find categorizing my books very helpful—and, on the off chance that you find those categories helpful, too, I want to be very clear on exactly what kind of read this is. Nordic Noir is a very specific kind of crime novel, and THE BOY AT THE DOOR is not best understood under its umbrella. When you think Nordic Noir, think of authors like Stieg Larsson, Jo Nesbo, Henning Mankell - authors whose crime books typically center around a police investigation, involve the exploration of social issues, and employ a dark, gritty style of storytelling throughout. They tend to be slower-burning, slightly more dense reads - and though there are of course exceptions to all these generalizations, it’s this style of book that is most typical of “Nordic Noir”. If that’s the kind of read you’re in the market for, THE BOY AT THE DOOR won’t be the right choice for you—and that’s why I think this distinction is so important. THE BOY AT THE DOOR is, by definition, Scandinavian crime fiction (it is, after all, a crime novel set in Scandinavia and written by a Scandinavian author! ), but readers who prefer psychological suspense over Nordic Noir will actually find themselves best aligned with Dahl’s writing. Perhaps most compelling of all is Dahl’s intentional positioning of her book not as your standard Nordic crime novel; she orients her story more towards an examination of life in Scandinavia, rather than an investigation of a crime committed against the same backdrop. If you don’t prefer to categorize your reads, that’s totally fine, too - but as CBTB readers know, I’m all about setting the right expectations for each book you pick up. In short: this book leans more towards the style of suspense writers like Clare Mackintosh and Fiona Barton than the style of Scandinavian writers like Jo Nesbo and Stieg Larsson. 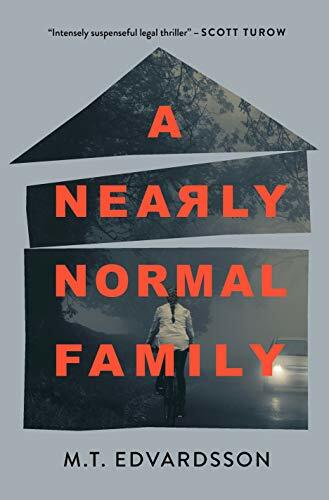 So now that we’ve established that this book is best understood as psychological suspense - why is it worth your time, when there are so many new suspense novels releasing weekly? Looking at the list of Summer 2018 releases I’m excited about, I’m struck by two developing trends: first, the unlikeable character seems to be having a moment (see: LYING IN WAIT by Liz Nugent and YOU WERE MADE FOR THIS by Michelle Sacks); second, psychological suspense novels exploring the experience of motherhood seem to be having a moment of their own as well (see also: THE PERFECT MOTHER by Aimee Molloy, and Sacks' YOU WERE MADE FOR THIS, too!). These two trends collide to pitch-perfect effect in Dahl’s taut debut. In the character of Cecilia Wilborg, Dahl weaves a story of the pressures of modern womanhood in all their complex, often quietly disturbing realities. Most compelling of all? Yes, this is fiction, but there’s a measure of truth behind what Dahl writes that will get under the skin of her readers. When you read the plot summary for this book, you may find yourself feeling lulled into a sense of familiarity with Cecilia’s character: another wife who “has it all”, including the picture-perfect family and the straight-out-of-a-magazine home -- that is, until her world threatens to be upended. But don’t be fooled by this frequently-employed launching point; Dahl’s story takes a new direction from its peers. On surface level, Cecilia’s story is that of so many other suspense novels’ protagonists, but dig just a bit deeper and you will find a character as complex as the mystery she becomes embroiled in. Cecilia is perfectly polished, friends with all the right people, endlessly devoted to her husband—but she’s also judgmental, manipulative, and willing to do whatever it takes to preserve the facade she’s created. In short: she’s not an instantly-sympathetic character. In fact, I’m pretty sure I spent more of this book not liking Cecilia than I did liking her, but it was that kernel of truth to her character that always kept me coming back for more: her determination to preserve the image she has created for herself and for her family is one that resonated with me on a level I was not fully expecting. Cecilia might not be the most lovable or endearing character, but her sharp edges are fascinating to observe. And of course, once the author has established just how deep Cecilia’s commitment to establishing and preserving this image really is, we get to witness its unraveling—and what a (disturbingly) fun, voyeuristic experience that is. When Cecilia offers to bring an abandoned little boy back to her house from the local pool, she could never imagine the events she was setting in motion... but thankfully, author Alex Dahl has a vivid imagination and lots of intrigue in store for both Cecilia and her readers. What follows is a twisting and immersive dive into the web of secrets that hide behind that perfect exterior of Cecilia’s—and the revelations about her past are as grim as they are heart-tugging. This isn’t a story of major plot twists - don’t go into it expecting earth-shattering revelations - but the reveals that Dahl does plot out are consistently entertaining and suitably surprising. While I did predict the reveal that comes to be the crux of the story, I didn’t find my reading experience hindered at all by my prediction of it; as I’ve always said, if a crime novel has enough substance to it, I don’t need a big twist to find the book satisfying. THE BOY AT THE DOOR has more than enough of its own strengths in place—it doesn’t need a shocking twist to make the reader happy to have spent time in its world. Come to this book for its story of long-held family secrets, its complex and compelling characters, and the winding, twisting mystery that is ultimately revealed to tie all of these pieces together. It’s also worth noting just how well Dahl balances the kind of pacing that will please lighter suspense fans with genuinely dark subject matter. Though this book might not rely as heavily as others on social commentary, it certainly provides readers with subject matter to chew on long after you've turned the book's final page. Along with her keen insights into the pressures of womanhood and motherhood, Dahl also uses THE BOY AT THE DOOR to delve into the topic of addiction. Through the character of Annika Lucasson, Dahl challenges readers to step into the life of a woman whose addictions have essentially stolen her own life from her. Annika’s is a tragic story—I found the chapters focusing on her experience genuinely hard to read, and Dahl doesn’t shy away from exploring every painful moment in Annika’s (often fruitless) efforts to escape her life and start anew. But once again, Dahl walks that fine line between these visceral moments and her book’s lighter pacing masterfully; after turning the book’s heartbreaking final few pages, I was struck by just how much I enjoyed reading this book, despite the genuinely difficult topics it explores -- and it’s that balance that, once again, made THE BOY AT THE DOOR such a pleasure to read. Readers looking for a summer binge-read with a dark side will love Alex Dahl's THE BOY AT THE DOOR. There's nothing typical about this book, and Dahl's debut is all the better for its willingness to blend its Scandinavian roots with a modern, on-trend psychological suspense plot. Pick this book up for its gorgeous cover and stay for its astute insights into modern womanhood and its tense, menacing atmosphere. Read an excerpt of THE BOY AT THE DOOR here!